Stephen Crane takes up the question of courage again, this time in a short story that is the "unknown sequel" to The Red Badge of Courage . The author re-introduces Henry Fleming later in life, adds some more depth to the character, and makes a final commentary on the question of courage. 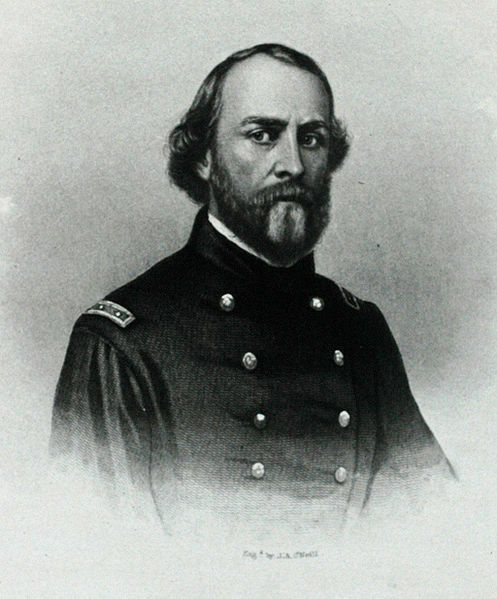 A lawyer and politician turned Civil War soldier, Major Sullivan Ballou was torn between love for his wife and family and his feelings of devotion and duty to his country. 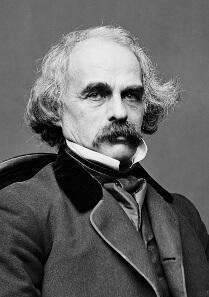 He penned his now famous letter on July 14, 1861. He was mortally wounded a week later at the First Battle of Bull Run (or First Manassas as the Confederates called it). He passed away on July 29th, just fifteen days after authoring the letter. A young Henry James, who was conscripted to fight but was excused due to a back injury, was empathetic to the plight of those who were drafted into the bloody Civil War. He was sympathetic to their many hardships, including ones of the heart. In this story, a young soldier, John Ford, urges his fiance to form other relationships while he heads off to War. Did David Duck come make it back alive or not? When the locket she fastened around her fiancee's neck came back from the front with a priest's letter, Octavie assumed a blessed resignation in her loss, but there's more to the story. This is a story that is rife with deeper symbolism as a white officer and his men, working their artillery, are transformed into 'black' men by their work. But do not focus on the literary techniques to distraction or you will miss the real art of the story, which first emerges with a soldier's hesitation. 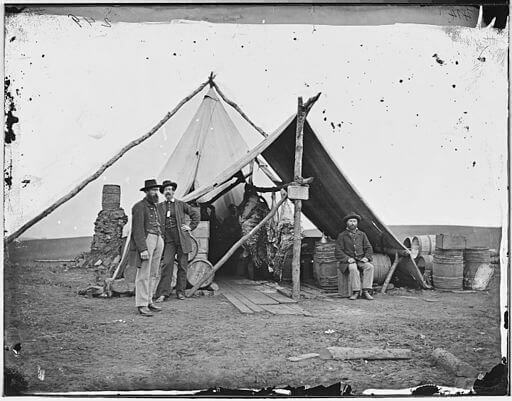 After an outburst at a trial, Union Army Lieutenant Philip Nolan is sentenced to a life of exile; to live out his days as a passenger on U.S. Navy warships where he is to learn no news of his country and others are forbidden to mention the "United States." This pro-Union story was an effective morale booster for the Union cause. 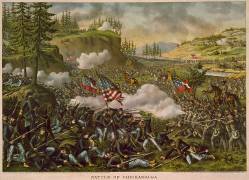 Fought on November 24, 1864, this battle was important because it pushed the Confederate flank, giving the Union forces a gateway to the deep South. Louisa May Alcott of Little Women fame served as a nurse during the War. In this short story she takes up questions of dignity, honor and loyalty and also sheds light on women's participation in the war. Yep, Bierce again. This time, a trio of characters are involved; the Halcrow brothers and Captain Madwell. Yep, "madwell," it seems like a loaded name to me too. In reply to an insult from one of the Halcrow brothers, Madwell replies, "Sir, I invite you to accompany the movement. A mounted officer would be a conspicuous mark, and I have long held the opinion that it would be better if you were dead." 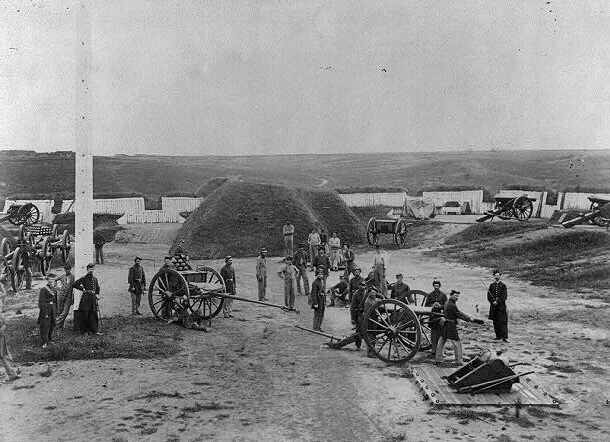 The story of Union Private Anson Marlow at the beginning of a battle as he lay dying. "He was conscious of little beyond a dull wonder." "[The boy] had slept through it all, grasping his little wooden sword with perhaps a tighter clutch in unconscious sympathy with his martial environment, but as heedless of the grandeur of the struggle as the dead who had died to make the glory." Discovery of a family history: "This comrade, running beside my uncle, saw the colors waver and sink as if falling, and looked to see that the boy's hand and forearm had been torn away by the exploding shrapnel. The boy did not realize the extent of his injury, for he laughed, shouted something which his comrade did not catch, caught the flag in his left hand, and ran on up the hill." 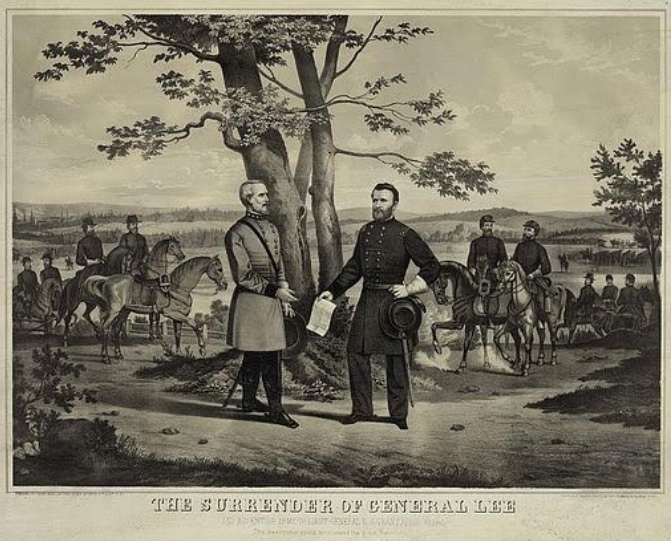 Page's landmark story deals with the emotional reactions of the Confederate soldiers upon hearing the news of Lee's surrender at the Appomattox Court House. Walt Whitman's plaintive poem lamenting the assassination of President Abraham Lincoln. 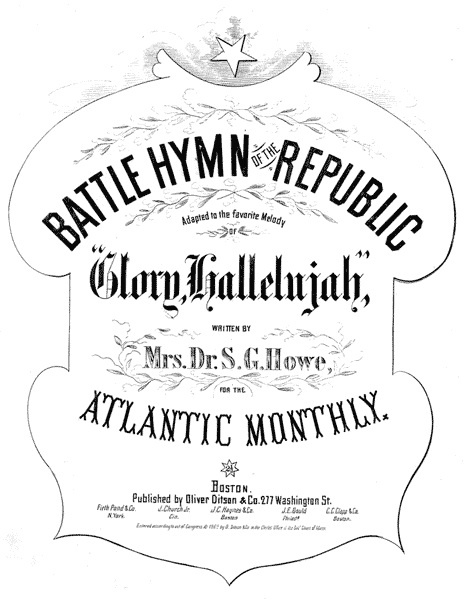 What became the most popular song for the Union during the Civil War, Howe wrote the acclaimed lyrics, "Mine eyes have seen the glory" after an inspiring visit with President Lincoln in 1862. We offer Johnny Cash's rendition of this moving song. "In youthful eagerness thou didst depart, at peril of they safety, peace, and life, to nurse the wounded soldier, swathe the dead,-- how pierced soon by fever's poisoned dart, and brought unconscious home, with wildered head." "Do not weep, maiden, for war is kind. Because your lover threw wild hands toward the sky and the affrighted steed ran on alone, do not weep. War is kind." 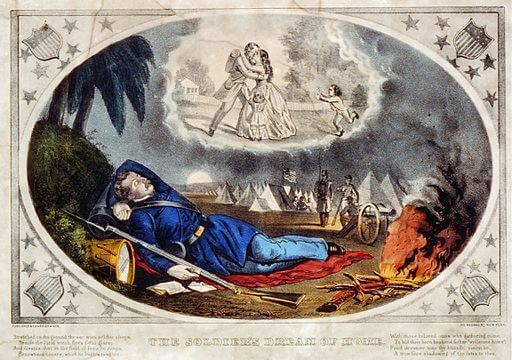 This Currier & Ives patriotic Civil War print was issued between 1861-65, depicting a Union soldier dreaming of being reunited with his family after reading a letter from home. A poetic plea against the vindictive cry raised by civilians shortly after the surrender at Appomattox, April 9, 1865. "The will, that never can relent-- the aim, survivor of the bafflement, make this memorial due." 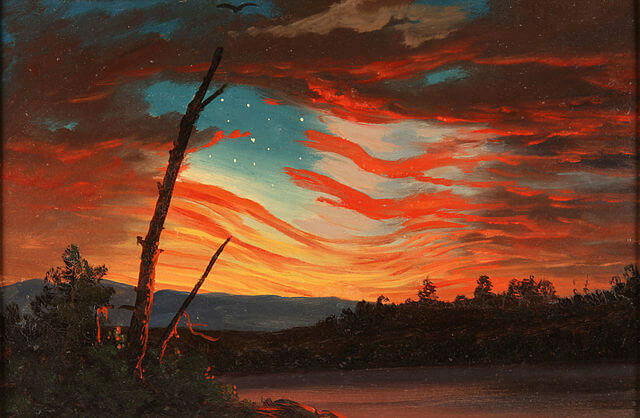 "But his harp belongs to the brave and free, and shall never sound in slavery!" This popular Irish folk song written after the Irish Rebellion of 1798 was revived during the American Civil War with a new third verse. 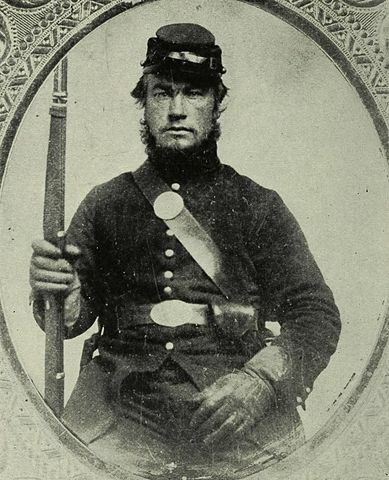 Commemorating William Scott, Union private from the 3rd Vermont Infantry, whose crime brought him before the firing squad, where his sentence and pardon by Lincoln were read together. He returned to battle, later killed at Lee's Mills. Printed on mourning ribbons for Lincoln: "Sing-- as they close the doors of earth upon him-- one verse, for the heavy hearts of soldiers." Walt Whitman wrote this poem in 1865, juxtaposing Lincoln's death with spring's bursting forth of life and renewal. An anti-slavery novel published in 1852, Uncle Tom's Cabin had a profound impact on the American landscape and is widely credited with fueling the abolitionist movement, and contributing materially to the the tensions leading up to the American Civil War. Published in 1895, a full thirty years after the American Civil War had ended, The Red Badge of Courage follows the trials and tribulations of Henry Fleming, a recruit in the American Civil War struggling with ideas of bravery and courage. Although Stephen Crane was born after the war and never participated in battle himself, he produced one of the most influential war novels of all time and veterans praised his ability to capture the true nature of the battles he described. Published in 1885, Grant's insightful autobiography focuses on his military career during the Mexican-American War and the U.S. Civil War. Considered one of the most important and influential writings of the Abolitionist Movement, detailing events of Douglass' life and the immorality of slavery itself. Considered one of the best examples of what's termed 'the slave narrative,' Hughes' book provided details that corroborated the mounting arguments against slavery. 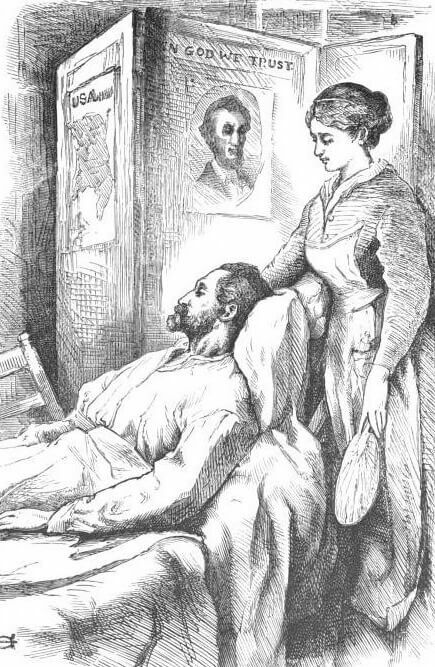 The founder of modern nursing famous for treating combat soldiers in Europe, was commissioned by the Virginia Army to write directions how to feed hundreds of soldiers in camps and care for the sick in hospitals during the American Civil War. 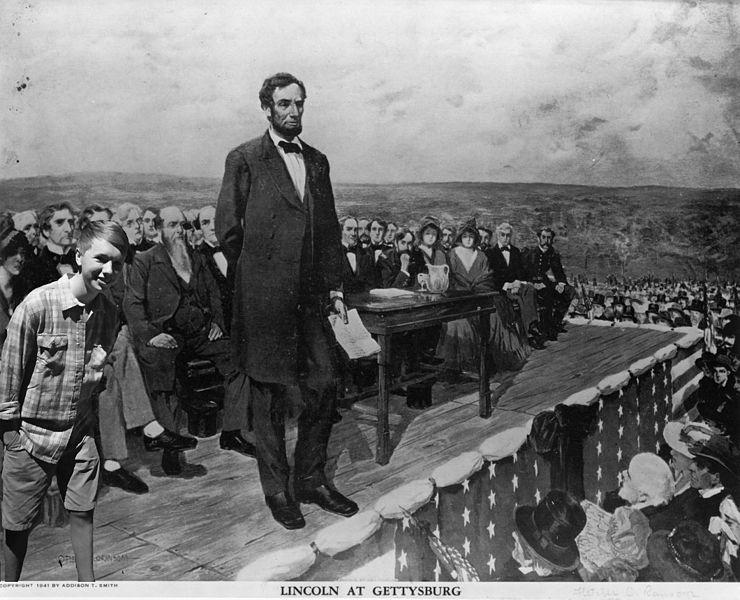 It was on the afternoon of Thursday, November 19, 1863 that American President Abraham Lincoln took the stage and delivered one of the most famous speeches in American History, The Gettysburg Address. In a speech lasting just over two minutes, President Lincoln gave a stirring address that covered the founding principals of the country, acknowledged the great sacrifice of life, and then importantly, cast the conflict into a moral dimension that redefined the struggle as a battle to bring equality to all the country's citizens. Abraham Lincoln gave his Second Inaugural on March 4th, 1865. The end of the war was approaching, but the president did not strike a triumphal tone, choosing instead to question why Providence had visited the terrible war on the American people and using biblical allusion to ponder some of the painful and troubling questions the war had wrought. The Second Inaugural is a masterpiece of solemn oratory. "With malice toward none, with charity for all, with firmness in the right as God gives us to see the right . . ." Lincoln was assassinated within weeks of this speech; and the country mourned -- "O Captain! My Captain!" 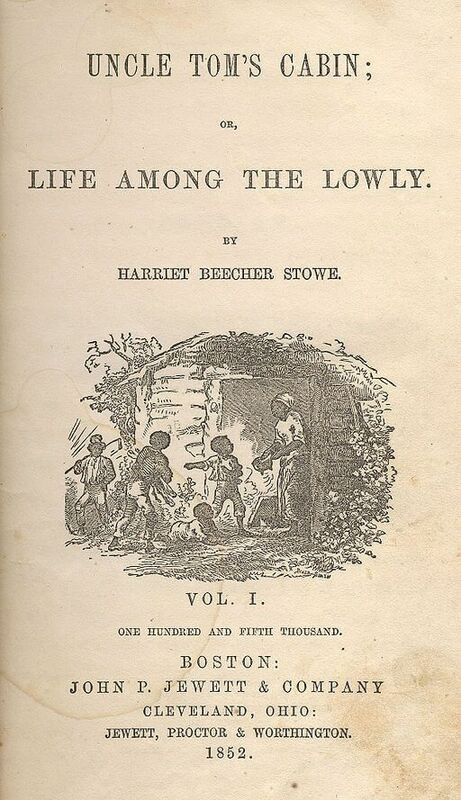 Stowe describes her legendary encounter with the African-American activist, published in 1864. Issued on September 22, 1862, this document declared that all persons held as slaves within any State will be forever free as of January 1, 1863. 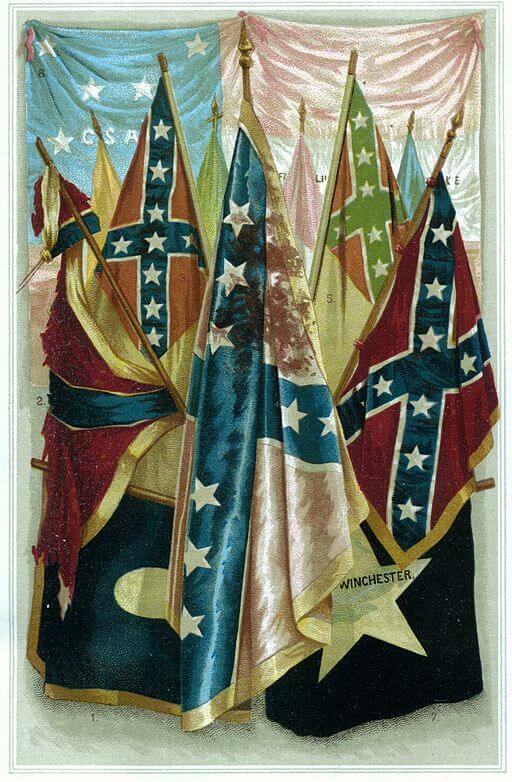 A summary of Amendments XIII - XV, passed between 1865 - 1870, referred to as the "Reconstruction Amendments."